Is DNA the Basis for all Life in the Universe? Presented by Chris Smith, Georgia Mills. A new technique could make it easier, and less traumatic, to get over phobias. Ben - Anxiety disorders, phobias, post traumatic stress disorder are much commoner than maybe we realise - they affect a large number of people. Graihagh - How many people do suffer with this sort of condition? Ben - I think one in fourteen represents the whole scope of anxiety disorders. Graihagh - Do you know why we have these fears in the first place? I have an irrational fear of velvet and I know it's irrational because velvet, I know, is never going to hurt me but it doesn't stop me from having huge heeby jeebies and the shivers everytime I see it anywhere near me! Ben - Yes. The list of phobias is long and diverse and there are some remarkable things people are afraid of. More common things are things like spiders and snakes. Velvet - I have not idea where that actually comes from but maybe there's something in your past which relates to that that I don't know about. 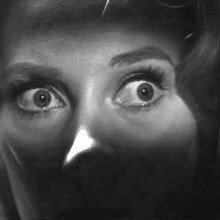 Graihagh - So how would you normally treat a fear? Ben - Usually therapies are orientated around confronting the fear in some respects. Graihagh - In my case, that would would mean stroking velvet repeatedly, which is hugely distressing. Thankfully though, Ben has found another way to treat phobias and it doesn't involve facing my fears. Ben - Imagine you're actually a subject in our experiment. On the first day we would show you a bunch of pictures like colourful circles and we'd get you to lie in a brain scanner and look at these different images. Over the past few years, we and others have developed ways of reading content in complex patterns of brain activity. So, for instance, for visual images it's now possible to decode with quite considerable specificity the content of what someone is looking at at any particular time. Graihagh - And this real time neuroimaging has been made possible by an artificially intelligent algorithm, which can quickly tease apart which pattern in the brain corresponds to seeing a coloured dot. So, if Ben shows you a red dot your brain might be like this... a blue dot like this... and a yellow dot like this. You get the picture. Next, every time you see that yellow dot, he give you a small electric shock. Ben is conditioning you to fear that yellow dot. Ben - And if we look in your brain we'd see a response in the fear nucleus of the brain, the amygdala. Graihagh - Amazingly, even if there is no yellow dot to be seen, every now and then that I'm scared of the yellow dot pattern resurfaces in your brain except you're totally unaware of thinking about it. Ben - This effectively happens subconsciously or unconsciously. And every time we see the brain enter into a state of similarity with the fear cue, we give the subject a reward - a little bit of money. What that does is attach a bit of positive value to some information in the brain which was previously associated with something aversive. So, in effect, it chips away at the aversiveness of that fear memory. Graihagh - Do this enough and, in theory, it means no touching velvet to overcome my fear. You're ridding someone of a phobia unconsciously and, therefore, it's stress free unlike traditional therapies of today. Ben - We've reduced the fear memory without the person experiencing any fear at al. That is something which is not a feature of any other procedure that we know of. 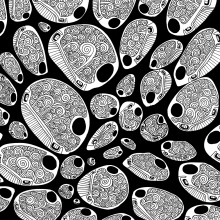 Could your gut bugs be playing a role in how your DNA is being expressed? John - When we consume food in our diet, if there's a fair amount of complex carbohydrates, which these bugs really like and they take this fuel and they convert it to small molecules that include things such as acetate, butyrate and propionate. These are small short chain fatty acids. So, for instance, acetate is essentially vinegar and so that gets absorbed by the host and is converted to information at the level of the epigenome. Kerstin - That sounds very exciting - how did you find all this out? John - We looked at and compared mice that were in a germ free environment so, basically, mice in a bubble versus those that are colonised and we compared the effect on the epigenome. One of the diets we looked is sort of a western type diet that has a much higher percentage of fat and simple sugars and we saw a real suppression of the effects on the host under a poor diet, so to speak. So the poor diet was suppressing this communication between our gut microbiome and the host epigenome so I think that's really an important finding. Kerstin - How do your findings translate to humans? How would you test for that in a human being? John - It's always tough to do such experiments in humans because it's hard to get people to eat what you want them to eat, right? There is evidence in humans that those molecules sort of individually, like acetate for instance, can have effects on humans. The question is are those effects going through the same mechanism that we've identified in the mouse? I suspect that they are, but that's for the future. But I think it's quite interesting in our human history we use a lot of acetate, we use a lot of vinegar under conditions where we can't, for instance, grow fresh vegetables. For about 5,000 years, we've been pickling things. One could imagine that many of the ways in which vinegar perhaps mediates some of it's health benefits that have been describe, maybe it's through a similar mechanism as we've discovered in the mouse experiments. Kerstin - So maybe there is a good reason why we put a pickled cucumber on our burger? John - Absolutely. Yes that's right. Kerstin - Indeed, John and his team saw similar epigenetic changes when they gave germ free mice some vinegar and the other fatty acids in their drinking water. And yet, John isn't advocating food supplements in order to reverse the effects of a crappy diet. There are lots of other health benefits to good food. John - Maybe one way to summarise is to listen to your gut. Is the golden ratio really represented all throughout nature? In this week's mythconception, Tim Revell is going for gold! Tim - Grab a ruler and measure the distance from your elbow to your wrist and then from your elbow to your fingertips. Divide the two measurements and what do you get? Math's most divine number - the golden ratio - or something close to it, or not so close to it. The myth isn't that precise. The golden ratio is the solution to the equation x2 -x-1=0, which turns out to be about 1.618. That could be the end of the story but there are many golden ratio 'mathconceptions', with most of the imparting an almost religious like level of infatuation with the number. It's known as the divine ratio for it's sheer beauty... seriously. They say architecture, painting, music, and even human faces with golden ratio proportions are universally preferred, but that's just bunk. When you actually test the proportions that people like most, there's never any preference for the golden ratio. The myth pushers also love to say that the ancient Greeks built the Parthenon in Athens using the golden ratio and that's why it's so beautiful, but it's simply not true. All you need to do is measure it to find out. The golden ratio is, actually, a really cool number with plenty of proper mathematical reasons to interested in it. The myths just detract from it. My favourite example links the fibonacci sequence, the golden ratio, and plants. 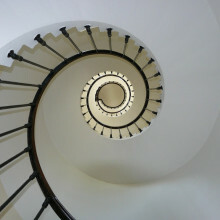 The fibonacci sequence is the one where the next number in the sequence is found by adding together the previous two. So starting with the sequence one one - the next number in the sequence is two. Found by adding together one and one. Then the next in the sequence is three, found by adding together one and two. And then the next is five, found by adding together two and three and so on. Meaning that the first few fibonacci's are one, one, two, three, five eight. Almost magically, if you work out the ratio between each consecutive number in the fibonacci sequence, you end up dancing around the golden ratio getting close and closer as the numbers get higher. The ratio three to two is 1.5, just below the golden ratio. The ratio five to three is 1.67, just above the golden ratio. And the ratio eight to five is 1.6, just below the golden ratio. As you get closer to infinity, the relationship between fibonacci numbers gets closer to the golden ratio. And plants love this too. Imagine trying to build the most efficient plant ever. You want to place your leaves in such a way that they overlap as little as possible to catch the most sunlight. Plants grow leaves in simple ways, with the angle between successive leaves always the same. So to design the best plant ever, all you need is to choose the optimum angle. The answer... divide the circle by the golden ratio then the resulting angle ensure your leaves never directly overlap. Incredibly, real life plants actually seem to use this. This means that when you look at the leaf patterns created, you almost end up with fibonacci numbers, e.g. in the number of petals on a daisy or the number of spirals on a pine cone. The golden ratio is actually pretty special - just not in the way a lot of people think. 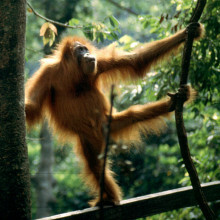 What do parkour athletes have in common with orang-utans? Lewis - I had a sort of epiphany. I think it was about 2009, I was at the Society for Experimental Biology annual conference. Dr Susannah Thorpe at the University of Birmingham was talking about locomotion in arboreal primates. She mentioned that there is very limited information on the energy costs for arboreal primates to move around in an energetically challenging environment. I thought well, um, why don't we measure energy expenditure in human beings moving around and kind of get them to do things that are ape-like. And that could be a first insightful step into the this world of the energetics of arboreal primates. Connie - Arboreal primates. Those are the types that spend some or most of their time in the trees, swinging from the branches. And Lewis had some new, exciting kit that could measure oxygen consumption through a mask whilst not impeding movement. But humans and apes, they seem quite different to me. Lewis - There's always going to be a limit to how much you can infer about a specific species from a referential model. The trade off it this - to try and gain an understanding of the energetic costs experienced by these animals in the wild directly is almost impossible. It's very, very hard to even see an orangutan in the wild, let alone capture or restrain or whatever an orangutan and then put equipment on it, that's never going to happen. The natural first step towards gaining some sort of insight into the energetics of their movements up in the trees is to work with a tractable model. Very obviously, the most tractable model for this situation is a human being and that's why I turned to our own species, if you like, to try and get some insight into these wonderful arboreal animals. Connie - So what sort of people would you use to simulate them? Well, parkour athletes of course. Lewis - They're basically street gymnasts who like to use, typically, the urban environment to move around with and they'll practice, and practice, and practice moving around certain routes within their environment, within their urban habitat. It's acrobatic and very impressive to watch. It's quite a new sport, but it's fairly hip and happening as it were, and so we thought these would be the people that could best emulate a tree dwelling primate. Conne - I like the idea of anyone who actually practices parkour listening to us trying to talk about it in a hip and happening way! Lewis - Yes - my apologies to all those parkour athletes out there. Connie - So what were you getting these guys to do; what were they doing to mimic apes? Lewis - We created several scenarios that were simulating a forest environment. It didn't look like a forest but it created situations somewhat akin to what arboreal primates will face, and then were able to measure the energy expenditure of these parkour athletes. Connie - Pole swinging, rope climbing, high level jumps. Lewis and his team created a veritable assault course for the athletes with the idea that these are big apes on sparse diets, and they are probably looking to use as little energy as possible. Lewis - They're moving through the trees and they come to a gap in the canopy, and basically they've got three options. One is to jump the gap, another one is to sway the tree they're on and bend it across the gap and the third one, which is the most simplest in a sense, is to climb down the tree they're on, walk across the canopy floor and climb up the next tree. What we found was that something like an order of magnitude more energy for them to climb down a tree, walk across a forest floor and climb up the next tree than if they find some way to bridge that gap staying up in the trees. We can infer from that that they're not going to want to lose height unless they've got to. Connie - Well sure. I'd rather take the path of least resistance too. But where does this sort of information fit into the bigger picture? Lewis - We need to go further now in looking at how an arboreal ape's total daily energy budget is split between its background costs just to exist, and it's costs to move, the costs to digest its food and then we can have a better idea about how their environments affect their energy expenditure, which of course drives how much food they need to eat. And then, in turn, we can have an idea about how their changing environment, so either indirectly due to climate change or more directly due to tree felling, how environmental change will affect their energy costs. So it's likely there is a breakpoint in terms of how much more energy they can can be expending, for example going up and down trees because the gaps in the tree canopy have become bigger or the only trees around are too small to climb across easily, but there's not going to be enough fruits available to service that energy cost. Where that point is I certainly couldn't say but I think it's reasonable to suggest that it may not be too far off. 18:48 - What would life be like on Mars? Would you go to Mars? And if you did, what would it be like to live there? What would life be like on Mars? Stephen - I honestly think that there's a better than 90 percent chance that there'll be people on Mars by 2030. But the real kicker is how many people will be on Mars by 2050? Because by 2050, if Elon Musk is correct, he'll have 1,000 rockets leaving at one time, each with 80 people in them. That's 80,000 people going to Mars in one trip, so it's highly conceivable that by 2050 there's 100,000 people on Mars. Stephen - Don't get me started on ESA and Beagle. Graihagh - ; If we can't get rovers to Mars, how are we going to get people? Stephen - This is a matter of money, and it's a matter of playing the odds in the space game. Rockets are binary - they work or they don't work. About 20 percent of the time they don't work. We had two shuttles that went down with eight people in each one of them. This is a dangerous business. It's not like getting in an aeroplane but that is not going to stop anyone from going. Graihagh - Well, why wouldn't it though? Why would we even want to go? Stephen - Well we really need a backup for civilisation on Earth. I mean we are long overdue for being hit by a major asteroid and that's just one of many, many, many extinction events for humans on Earth. We've spent 95 percent of our existence as humans moving beyond the horizon into the next wilderness because it's a matter of survival. Marek - Well you wouldn't want to go there in your swimsuit. The temperatures can can go as low as -70 degrees centigrade. Perhaps on a warm summer's day at the equator they might just nudge zero, maybe a little bit higher than that. The air pressure is one percent that on Earth and the air is mostly carbon dioxide so completely unbreathable for humans. And as if that wasn't enough, there's also a very high radiation environment on Mars. Graihagh - What happens if there's not enough pressure? Marek - Well we don't really think about air pressure do we and we walk around with 100 kilometres of air weighing down on us. And, to some extent, we've evolved to cope with those conditions and that pressure actually helps us to keep our insides inside. Graihagh - I'm imagining some sort of gelatinous mess on the floor that's very... sunburnt? Marek - Yes. I think the race if you were exposed on the Martian surface would be whether your body fluids would evaporate first or whether they would freeze first because, of course, it's very cold. So you'd probably end up being freeze dried. Graihagh - Not a pretty sight then! There are lots of problems we need to solve when it comes to moving to the red planet. And one of the biggest ones for me is will we actually be able to get people back home to planet Earth? Fundamentally though, when we're there, we need four things: food, water, shelter and oxygen. 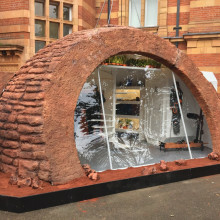 As it happens, National Geographic have built the first ever Mars show home to celebrate their new mini-series called "Mars." It looks like a red igloo. It's about 4 metres across - photos are up on our Facebook page by the way if you want to have a look. Just search for Naked Scientists. Marek - So we're standing outside the Mars home and it looks like an igloo made of red martian bricks basically. But we're going to go inside now... so welcome to the Mars home. Graihagh - Thank goodness. It's absolutely freezing on Mars. There's no airlock? Marek - Well there is now. This is the airlock. Graihagh - But there's no cruckuchoo..
Marek - Do you want to do the sound effects? Graihagh - I mean that was pretty good, right? Graihagh - I see a pie! Marek - There is a pie that would probably be freeze dried for the journey. There's also a coffee maker and I think it would be quite hipster to maybe grow your coffee in martian soil. So it would be absolutely hipster authentic coffee. But you're going to have to take everything you need with you. But to keep costs and transport down, probably what they're going to have is a lot of 3D printing. So, over here in the corner we have a 3D printer just by the desk and that will be able to print out all sorts of different tools. So very, very useful technology that, I think, will make things a lot easier. Marek - ... geologists tools and rocks so geology is going to be a big thing. We're going to want to understand the geological history of Mars, and also to look for things like fossils of past life and even evidence of current life. Graihagh - Okay. And the final thing I want to talk about is the spacesuit. Because we think about space suits as these clumpy great big michelin man style things and what you've got over there is nothing like that. Marek - The ones on Mars are going to use mechanical support to keep you held in against the lack of external pressure. So they're going to be a lot more like wetsuits perhaps with external support structures. And then, of course, you'll have a helmet which will need to be pressurised and I think there are still issues to be worked through on how you marry the pressurised helmet bit with the more skintight wetsuit part of the suit. And also, of course, we've got a little bit of greenery in here. So this is great because it's a way of growing food. It also provides a little bit of oxygen and also I think it just give you a sense of being back home. Marek - Absolutely. The psychology of the astronauts will be hugely important. So it's not just about their physical health, it is about their mental health. They're going to be working in very close quarters for several years. Graihagh - Now it's all very sleek and slimline and it's very compactly designed. But do you think this is realistic? An interpretation of what living on Mars might be like? Marek - Who knows over the next couple of decades how people will decide to design the interior of these places but I think this is a pretty good guess. It's a bit like sort of Martian Ikea if you like. It's all very sleek, kind of Scandi, quite stylish. Marek - Orange and white. Quite bright kind of cheery colours. I would certainly be quite happy to have this as my office and I think, actually, it's nicer than a lot of London flats. So I think they're going to be pretty happy here, you've got all mod cons. And you're also going to be part of one of the greatest adventures that humanity has ever undertaken. Graihagh - Your name will go down in history books. Graihagh - That said, would you go? Marek - I would be really happy to go and visit Mars. I would even go for a couple of years but only if I could come back. 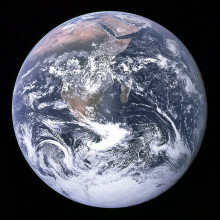 The Earth is, I think, the most beautiful and amazing planet that we've discovered so far in the whole universe. Certainly it's the most beautiful planet in the solar system. I have not finished exploring it. 27:31 - Would aliens have DNA? 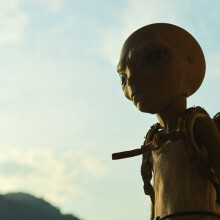 Would aliens necessarily have DNA, like we do? Now we're moving on to the main part of the show and this week is all about life's favourite molecule DNA, the spiral at the heart of the cells in every living creature. So is DNA the holy grail of evolution across the Universe? Before we turn to science, let's turn to science fiction, in this story written by MIT student Alexandra Sourakov, based on an idea by Linus Pauling. 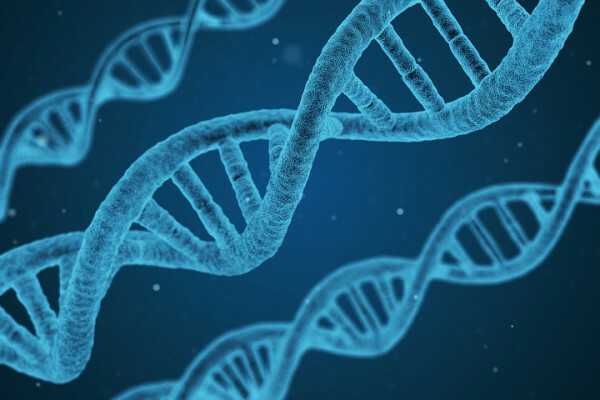 Imagine a groups of aliens with similar DNA to our own, only theirs twists the other way, so there are two groups: L and D, read here by Rox Middleton. Rox - Earth's inhabitants were famous across the galaxy for their propensity for taking in the less fortunate. So when it became apparent that the D-humans could no longer remain in their home planet, the L-humans of Earth welcomed these refugees with open arms. After leading a long and extensive campaign to convince the people of planet Earth to help our chiral brethren, the scientists finally won the polarising debate. However, since the formulation of the plan to help the D-humans there had been a few hiccups. The scientists had somehow overlooked the crucial fact that D-humans could not actually derive nutrition from L-food and so sprung up the Institute of D-Nutrition. But the most heartbreaking hiccup of all - we were biologically incompatible. 29:26 - How did life begin? How did life start on earth? Matt - Essentially, as far back as we can see, we think we can find traces of life. So, as we look back in the rock record of the Earth, we start to run out of actual records somewhere about 3.8 billion years ago, but as far back as that we think we can find traces of carbon isotope effects that suggest life was there even as early as that. Chris - And suggests that whatever that process was, it happened quick? Matt - On a geological timescale - quick. But on a chemical timescale - it's still a long period of history. We still have almost half a billion years between the moon forming event when no life could have existed on Earth, the Earth was just too hot, literally molten rock, and 3.8 billion years. There's nearly half a billion years and chemically that's a long time. Geologically, it's quite a short period. Chris - So would you like to speculate for me and tell me what you think those first life forms, or those first life processes were - what happened? Matt - Yes. So to think about that, we need to think about what it is to be alive and that's a very difficult thing for us to formulate opinions upon because we only have one example of life and all that life on Earth is all related. It's all part of the same family tree. But generalistically, there is a working model. This was developed by a panel for NASA of what life is and that is a self-sustaining system of chemicals that can undergo Darwinian evolution. So, to have a system of chemicals that can do this we need a molecule that can pass information from one generation to the next. And what biology uses for this are nucleic acids, so like DNA and it's close cousin RNA. These are polymeric molecules, so a molecule that's a string of individual components. A bit like a string of beads and each bead has an informational unit, or is an informational unit. The order in which we build the string of beads then gives us a message, and that message can talk to itself and to other molecules which then allows it to be copied and allows it to have utility and function. So once you have a molecule that has information and can be copied, then you can start to access the processes of Darwinian evolution. Chris - So you think the first life was a sequence of chemical reactions which store information in some kind of molecule, maybe like DNA, and it inherently has this ability to copy itself and control what happens to it and it then, ultimately, adds extra complexity that turns into things like the cells that we have that make our bodies? Matt - That is part of the answer. You need an informational molecules, something that can retain information over many generations, but that molecule doesn't seem to be able to function on it's own. We need other things like a lipid membrane to isolate that information from other forms of information. So realistically, looking for one molecule that is the origin of life is unlikely to give us a fruitful answer. We need many molecules to understand how all of those come together and how they're generationally linked to understand where life could have come from. Chris - And actually how do we think that happened? Why did this miracle occur? Matt - Current evidence points to the fact that if we take very simple, geochemically plausible one and two carbon units, they can be reacted together in very simple, very robust reactions to give, specifically, the components that we find in biology. Then if these have energy, if we have the ability to keep recreating these molecules, you can understand how something that can replicate itself can come to dominate a chemical system and start to lead to the processes that we now recognise as life. Chris - And since we can regard this as capable of being reduced down to chemistry, and given the ubiquity of chemistry in the universe. We know that we've got the same elements here on Earth that we have on Mars and beyond our galaxy and across the universe. Does that mean then, that it's likely that alien life probably will settle on the same sorts of chemistry that we have observed here on Earth and, therefore, we probably do have a high likelihood of meeting aliens that also use DNA as their hereditary material? Matt - In my opinion, the chemistry that governs why our biology selected the fundamental conserved metabolites that are essential to all living cells, that chemistry is based on some very selective reactions that can assemble these molecules, and these molecules specifically from very, very simple chemical precursors. These chemical precursors we find throughout the universe so, for example, hydrogen cyanide. A very simple compound, we find it everywhere we look in the universe. Chris - Not terribly good for you though! Matt - Not for us, but for early life it is thought to be an essential element to building both proteins and nuclear base material. So it's not only the relationship of the individual molecule, so how easy DNA or RNA is to make. It's also the relationship to the other molecules of biology. So the same chemistries that builds nucleotides, build amino acids and can be used to build lipids. So it's the interrelationship of all these molecules and the fact that they are all synthesised, through very simple and similar mechanisms, suggest a universality to that chemistry. There are, obviously, ways you can change it slightly in small ways and you have variations on the theme, but I believe the overarching mechanisms that biology uses at the most fundamental level will likely be universal, or could be replicated many times throughout the universe. Chris - In conditions as exists here on Earth because we know our own solar system? If you go to Titan, for example, one of moons of Saturn, you will find an ocean there but it's an ocean of ethane. The temperature is -200 and something degrees C. So could we see other chemistries that sustain other interesting life processes? We wouldn't recognise them as our sort of life, but they're still life. Matt - It is absolutely a possibility that in different conditions we could envision something very, very different as life but it would have to be phenomenally different. For life to have evolved as we know it in an organic environment like ethane, we have to change everything about the cell. So cell membranes are built on the process of excluding water, so the lipophilic interactions of amphiphiles. The same is true of DNA. So DNA has a lipophilic core and it's this exclusion of water that drives so much of life's processes that to envisage life, for example on Titan in a hydrocarbon environment, it would have to be fundamentally different from our life at every level. How do we find DNA? And can we use sequencing to work out what's in our smoothie? The best way to look at life here on earth, is by reading the DNA code in an organism. Until recently this would have cost thousands of Pounds, and required a high tech lab. But new technology means that, now, almost anyone - including a school biology class - can sequence the string of DNA letters or "bases" that make up the genetic code inside a cell... including inside the fruits you throw into your morning smoothie. Kerstin Göpfrich went on a mission to get hers sequenced. Just the strawberries and a banana my love, yes? Kerstin - Yes, please thanks. I'm just going to weight the banana for you... £2.29 altogether. I'll put strawberries in a bag for you. Student - I don't know... strawberries. Student - I was going to say a banana. Some yogurt. Student - A banana probably, yes. Kim - Maybe a good idea would be to sequence the DNA because each species of fruit will have a different DNA and we can use that to tell what's in the smoothie. Student - We add dish soap to destroy the membrane that surrounds the cell, which is like getting fat off dirty dishes. Student - The DNA's still wrapped around little proteins so we have to add salt which binds the DNA and replaces the proteins. Student - We sieved the smoothie mix that we had to remove any solids like seeds. Student - We need to pick the DNA out. We do that by adding alcohol because it makes the DNA clump together. Student - ... white and mushy. Kerstin - That is DNA. Kim is fishing some of it out. Kim - Wow, that's amazing, okay. What I've brought here with me in this tube is some magnetic beads. And the DNA will bind to these beads, and we can use that to exchange what solution the DNA is in. Kerstin - That is step 5. Clean up the DNA and dissolve it in water. While we wait Kim is passing around the key bit of technology - the nanopore sequencer developed by Oxford Nanopore Technologies. It is a small hand-held device that plugs into a laptop like a USB stick. A nanopore is a tiny hole in a membrane, a million times smaller than the eye of a needle. How can it be used to sequence DNA? Kim - In nanopore sequencing, DNA goes through a tiny hole and causes a characteristic disturbance in the current that flows across that hole and from that we can tell the sequence of the DNA. So DNA blocks part of the hole and that causes a different disturbance in the current depending upon what the sequence of the DNA is. Kerstin - Is it going to work? I'm sceptical. One last step before we find out. Step 6 - Heat the DNA to 37 and then to 70 degrees Celsius. Student - So we're just warming it up to 37 degrees. Hence why I'm rubbing it... It's so we can prepare it for when we sequence the DNA. Kim - What we're doing here is, just in the same way that you have to cook spaghetti before you eat it, we're transforming the DNA into a format that can be read by the nanopore. So that involves us breaking the DNA into sensible size fragments, and it involves us putting some additional fragments of DNA in. So that's going to direct the DNA to the nanopore and help to pull it through. Kerstin - That means we are ready for step 7 - Sequence the DNA. Student - You've put a solution of the DNA into the nanopore sequencer and that's going to transfer the data to the computer where it's going to be read. Kerstin - The cool thing with this technology is that you can really see the data appearing in real time. As the DNA is pulled through the nanopore the computer is drawing the different current levels onto the screen, corresponding to different combinations of DNA bases. A bit like writing music where different levels correspond to different notes. We may not be so pressed in time for our smoothie, but in the clinic this could really make a difference, Kim told me. The other big plus compared to competing sequencing technologies is that the device is portable. It is currently used to monitor the Zika epidemic in Brazil and by ecologists; present, and maybe future ones. Student - I would go to the jungle because there's loads of animals there. Like loads of different species and you could just find their origins. Kerstin - Sounds all very sensible. What does Kim think of my idea to sequence a smoothie? 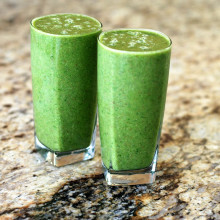 Kim - For me, the easiest way to find out what's in a smoothie is maybe drink it and see what it tastes like. But it is going to be useful maybe if you're involved in checking food standards. There's no better way to be 100 percent certain about what someone's put in their smoothie than to check the DNA. It would also be a way you could check whether there was some bacterial contamination in the smoothie, maybe meaning that the smoothie's gone bad. Kerstin - Lots of applications there. Does that mean we don't need lab sequencing centres any more? Kim - Some of the other sequencing technologies have really strong benefits too. They're really good at sequencing lots of samples in one go and they're really accurate. Nanopore technology just has different pros and cons. It's a different part of the biologist's toolkit. Kerstin - But back to our smoothie. Our DNA extraction was better than expected. Lots to sequence and more readings of DNA were still coming in. So Kim send us the results the next day. Pages of spreadsheets filled with the letters A, T, C, and G. A code that does not mean very much to me. Student - So once we've sequenced the DNA, we need to copy and paste that to an online database and you can use that to find out what was in the smoothie. Kerstin - What was in the smoothie then? Student - Fragaria ananassa and Musa acuminata. So we found out that in the smoothie there was banana and strawberry. Kerstin - Mystery solved. We read an impressive total of ten million DNA bases. Back in 2000, that would have cost 100,000 dollars and we would have been in a big sequencing centre, not in a classroom. Quite impressive how the technology has evolved over the past decade. Could we search for DNA in space? Aaron - Actually, we're sequencing DNA in space right now on the International Space Station. Aaron - It kinda depends on who you ask. Our team has microbiologists, infectious disease experts and also some astrobiologists. For the crew health standpoint, if you have a sequencer you can identify microbes in air, surfaces, and water and make sure that everything's safe. And also, if a crew member shows signs of illness, then you can diagnose the disease that they have and determine the appropriate treatment, so if they need antimicrobials or if an infection will go away on its own. Chris - And actually the process of DNA sequencing, "it doesn't mind" being in microgravity such as the international space station - it doesn't affect the process? Aaron - So far it hasn't. We weren't really concerned about the nanopores themselves, and the mechanism for sequencing and passing the DNA through. The bigger question was whether the flow cells can survive the launch vibrations and shock just to get up to the space station. And then whether or not the crew members themselves would be able to move the fluids around and load the flow cell without introducing air bubbles. But we're eight experiments in and things are going great. Chris - Well that's very encouraging. Now returning to the question the student asked: could we, or would there be virtue in taking a device like this to a place like Mars and looking for vestiges of DNA in space? Because Matt Powner's saying that the same chemistry applies across the universe, therefore it's likely we might be meeting aliens that use the same sorts of genetic heritable material like DNA that we do. Aaron - Yeah. So I would agree with that from the fundamental chemistry level. And we also know we have meteorites from Mars that have landed on Earth, so we know that material from Mars can make it to Earth. And then we have also sent a number of spacecraft from Earth to Mars so we know that we have sent a few microbes attached to those spacecraft. So there's a good reason to think, at least in these kind of events, you transfer organisms from Earth to Mars and visa versa. Chris - So there's reason to suspect we might find DNA. But what about alien DNA and if they don't use DNA DNA, like we do but they have something similar, could you use the same sort of platform or technology to go hunting for that instead? Aaron - Yeah, that's one of the really intriguing things about the nanopore sensor is because you're actually analysing the molecule directly when it's going through the nanopore, you can measure a whole lot of things. So not just DNA but people have shown you can directly sequence RNA, and even proteins that they've actually passed through these pores. So you can imagine that if you had alien life that used a different alphabet you would still be able to pass those molecules through the nanopore and get that current change that would be diagnostic of an informational molecule going through it. 49:16 - DNA: meet XNA! Does life need DNA? Researchers have now made a similar substance called XNA. Vitor - You heard before DNA being described as a sort of beads on a string and you heard the base that make up DNA. Effectively, if you take a bead and actually break it into three different parts. So the base itself are sugars or ribos in the phosphate. In principle, if you change any one of those you can affect the function of the molecule. You can affect how it behaves chemically and biologically. If you change any of those you have a synthetic nucleic acid, which can store information, and we call those xenobiotic nucleic acids or XNA. Georgia - Okay. So XNA. So what you've done is you've changed one small ingredient in the DNA chain and this has made this XNA? Vitor - Yeah. Because if you change that one particular feature into every bead, into every sort of rung of the ladder, you actually end up with something that's very different but can still store genetic information. Georgia - Okay. So my next question is: why do we need another thing - isn't DNA enough? Vitor - It has been so far. But you can argue from a theoretical perspective - Matthew mentioned earlier on you have n = 1 biology. So we don't know whether anything else is possible. So, of course, if you can generate a new genetic material and prove that life can be sustained by it, you actually answer a very interesting question, that life doesn't have to be DNA. There are also more practical applications, both in medical applications and materials. Georgia - Okay. So what kinds of things can you do with this XNA? Vitor - So XNA, you could use it as a material or even as a therapeutic agent. Those are the key applications for it. Georgia - Why would it be useful as a therapeutic agent? Vitor - Biology has evolved to essentially exclude biology, so defend itself against other life forms. So it very quickly identifies and destroys any invasive RNA, any invading DNA. But of course XNA, depending on the modification can sidestep that. It can be sort of not seen by biology. Georgia - I see. So it could be a way of smuggling biological drugs into someone's body without their immune system noticing? Georgia - What kind of therapies are we talking about here? Vitor - For instance, there's Duchenne muscular dystrophy. The disease is caused by exon skipping so the natural processes in the cell don't recognise the right elements. So even though you're starting from, potentially, nearly correct DNA molecule, you end up with a protein that doesn't work well. Georgia - Okay, so those cells not reading the DNA correctly? Vitor - Yeah. And here's where if you have a molecule, and this is work done by Mike Gate here at the MRC laboratory of Molecular Biology in Cambridge. With some XNA chemistry you can target the DNA and force the cell machinery to skip to something a lot less troublesome, a lot less closer to the disease state. And, in effect, that then gives you a therapy value. Georgia - And when you say you've created a new kind of DNA, a new thing altogether, can you create life like this? Vitor - In principle, yes. Of course, the very first proof of principle was to show that with a different nucleic acid you could store information and you could then recover that information. From that proof of principle, it makes it feasible then to evolve every other component you need to make that information compatible with current biology. And, to some extent, my group is currently doing that. Georgia - So you could you create a whole new lease of life with these XNA forming its basis? Vitor - Yeah. Again, in principle yes. Because from the moment you have a single gene that is made of XNA, technically you can make every other gene you need in XNA and eventually sustain life itself. Georgia - We've been talking a lot in the show about whether DNA is the blueprint for life everywhere. Does your work suggest it's not - what do you think about that? Vitor - It would be a question of whether biology is based only on what's natural or what's feasible. Matt mentioned earlier on that as long as the chemistry allows it you can do it. It's the same thing - biology doesn't invent things very often but when it does invent it optimises it very well. So in a different scenario where you have different precursors available, you could actually have a different chemistry, so you could have life based on a different molecule. Given different precursors, I don't see why something different couldn't have emerged. We had the story about the L- and D- DNAs. Yeah that would be possible. 56:08 - Why does a broken magnet form two new ones? Why does a broken magnet form two new ones? Tim - Thinking of magnets having a north and south pole is slightly misleading. They have a thing known as a dipole. This means that they have one pole with a north and south end, but it is a little more complicated than that. What we think of as a magnet - a bar magnet is made of lots of little magnets all pointing the same way as each other. These little magnets are called domains and each has it's own dipole, so a north and south end. Therefore the strength of the magnet is the total of all these little magnets. However, if all the little magnets point in a random direction, then the total would be zero; there would be no magnetisation. Before you may have been told to be careful not to drop magnets. This is because, if we shake around all the little magnets, they will no longer point in the same direction and so the magnet will no longer be magnetised. Liam - Noted - don't drop magnets. But wait a minute, how do we get our little magnets all lined up beforehand? Tim - We do this by putting the magnet near a really strong magnet, which then pulls all the little magnets to point in the same direction. 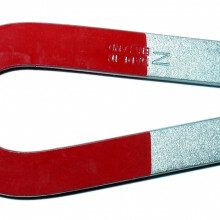 If the really strong magnet is then taken away, there is nothing to pull the little magnet away from pointing in this direction, so they stay happily pointing in the same direction and we have magnetisation. Liam - To make a magnet, we need a magnet? Luckily there are both naturally occurring magnets and electromagnets for this task. However we make them we always get the situation of loads of little magnets all pointing in the same direction. So what happens when we break a magnet in half? Tim - You split into two magnets made of lots of little magnets all pointing in the same way. So if the right hand of the original was north and the left hand south, then the right hand end of the two new magnets would be north and the left hand end south. The direction of the dipole hasn't changed - the north end and the south end are still in the same place. The strength of these new magnets is half that of the original as it is made from half of the little magnets. The magnet doesn't need to know it has been broken or change its magnetic structure, it already has the new poles. Previous How does pepper spray work? Next Why does a broken magnet form two new ones? What is Sagittarius B, the star forming region doing? Is earth moving at close to the speed of light? Why did grounded Faraday cloth behind my headboard increase EMF signals?